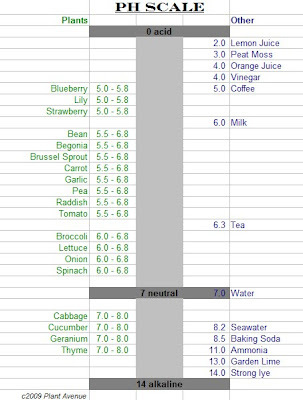 This chart is a work in progress, and I'm not a botanist or chemist... I put it together as a guide for myself re: my plants and how they are compatible with the soil in my garden based on some of the types of things I compost. There are a few items on there that I don't compost, such as milk, that I've included just for interest. I've noticed an interesting thing: I drink a lot of coffee, which is acidic, and I compost all of the grinds and filters. On the other hand, we eat very few eggs (the shells of which contain lime, which can make your soil more alkaline). You're really going about this like a science. Good work! Many plants have an acidity preference, but one shot of coffee isn't likely to harm them. If you're unsure, flush out the soil with water (such as by soaking the pot) then let it drain out completely to dilute any acidity -- never letting the pot sit too long in water. Ground oyster shells are sometimes used as a mulch by serious geranium aka pelargonium enthusiasts. Thanks for dropping by Toronto Gardens today. I have been following a tip that I have read somewhere regarding coffee. After I repack my coffee powder, I pour some water into the empty packet and empty the contents onto parts of my lawn where my neighbours' cats love to poo. I find that this keeps them away. Maybe they don't like coffee. I've just found your site through Blotanical - I hope we'll see you there a lot. I really like the approach you've taken in your blog - it's great to see a blog which is researching and analysing seriously without pretending to "know-it-all". This is one of the most interesting posts I recently read! What an interesting approach to PH level and a compost pile! It makes me feel good - I like both, coffee and eggs! Thank you, I really enjoyed your post! And Welcome to Blotanical!